It’s been a year since we lost our Buddy Girl, and it was difficult not to think of her during Christmas. I have been mulling over this post for a while, as I finish up the e-book about her and what she taught us. Mainly, she taught us about joy. Christmas was Buddy Girl’s favorite time of year, and we loved getting presents for her, as we don’t have kids. She loved nosing into her stocking, she rejoiced in every gift, she even learned how to unwrap her presents on command. 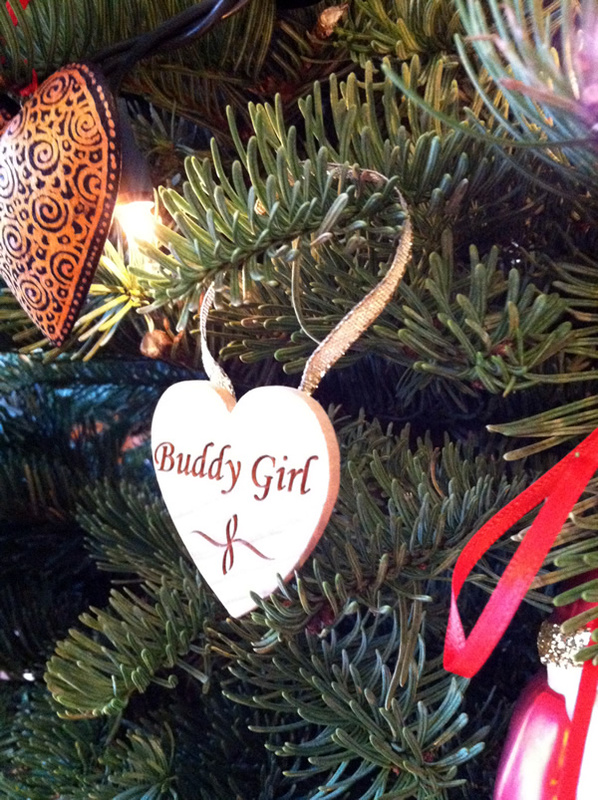 When we were pulling out the ornaments to decorate the tree this year, of course we thought of her. Last Christmas was precious to us, as we didn’t yet know she had cancer. When I look at her photos and video now, she did look very old. But you don’t notice it in person as someone ages, as she was as delighted and puppylike as ever. First we unpacked this handmade ornament from a friend. That started us talking about her. 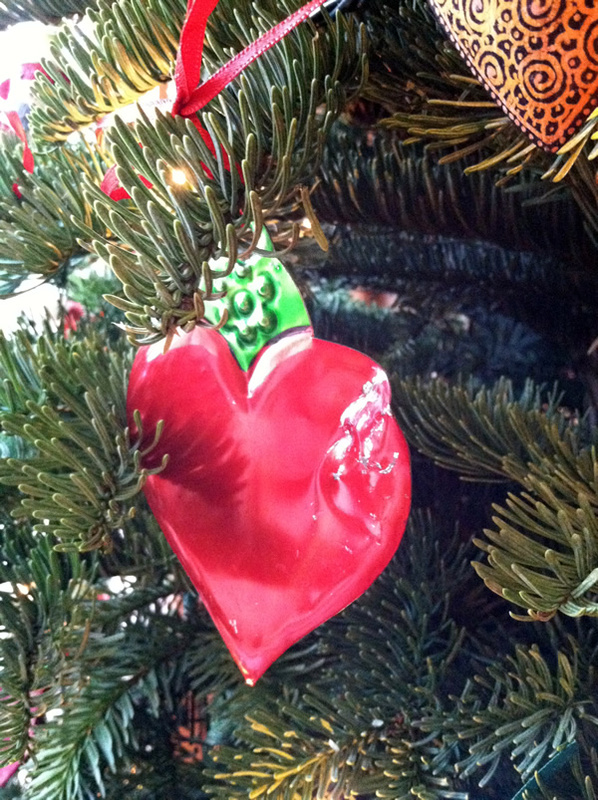 Then, this ornament that she chewed during her first Christmas as a tiny pup. Next was the wooden heart that came on the bag holding her ashes. 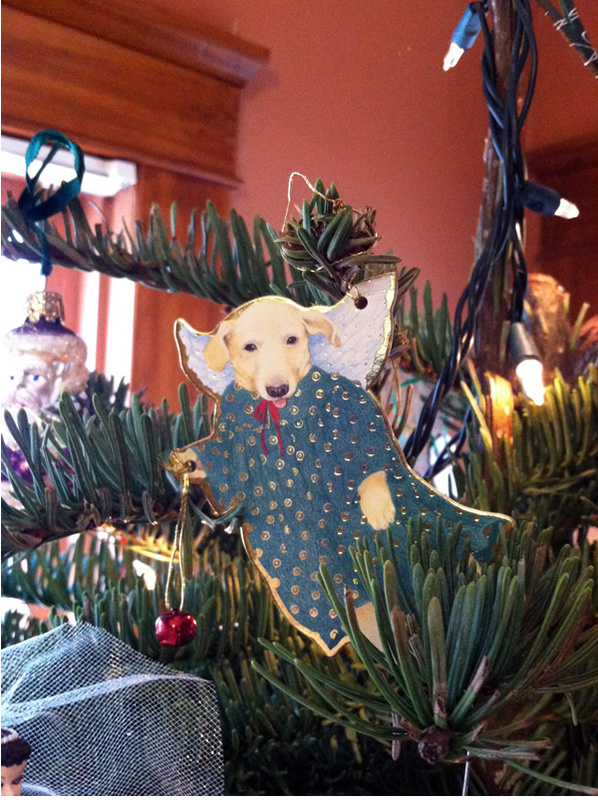 But the one that made me cry was the doggie angel, which we hung high on the tree. 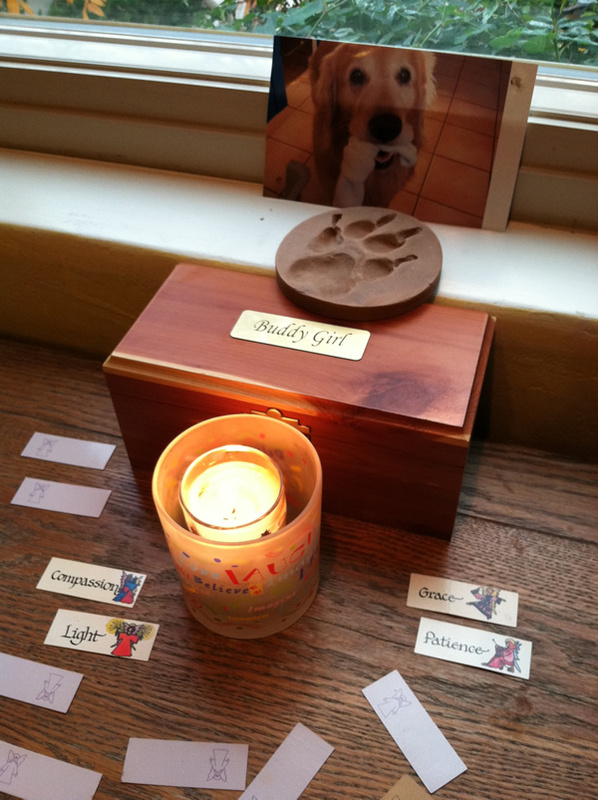 Buddy Girl would not understand crying or sadness as she was completely joyful, even at the end. As I explore in the book , we always have a choice to make when something terrible or sad has happened. We can focus on it, surround ourselves with it, wallow in it even, or we can acknowledge it and choose joy. 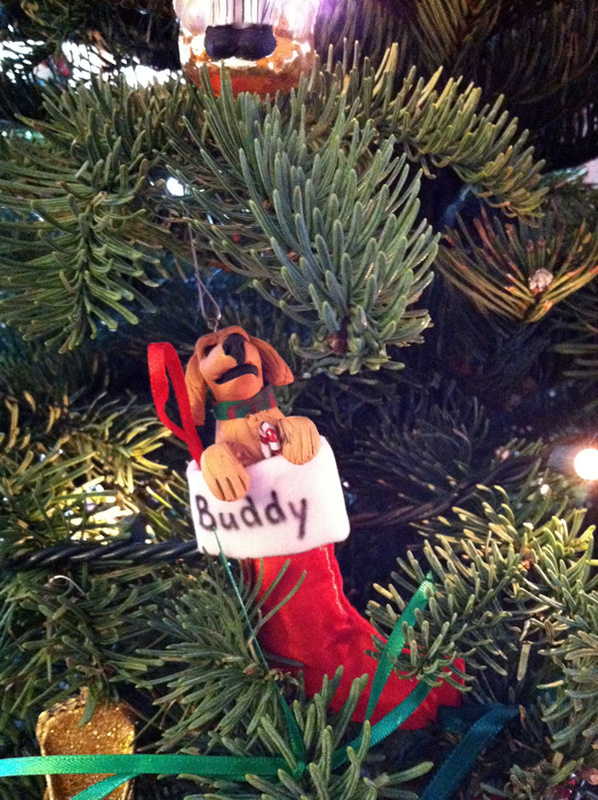 I could have spent the entire Christmas season missing Buddy and not fully embracing Daisy’s first Christmas. I could have watched videos of her last Christmases, or her other Christmases, over and over again, banking the fires of sadness and grief. Instead, I finished up her book, which will be a beautiful tribute to her. I took time off from the Internet and social media, went hiking with The Husband, took Daisy to see her first snow. We chose to start new traditions, and to be fully present with our new joy. And at sunset on January 1st, one year after her last night, we chose new angel cards for this year, said a prayer for her, and sent a Sky Lantern upward to honor her. We know that our angel dog is watching over us. And we know that she would want us to choose joy. Thank you Carolyn, I really appreciate the sweet words. She certainly was an expert at choosing joy. Always.